Are you one of those people who recognizes many classic prayers and melodies from your childood but never learned what the prayers are really saying? 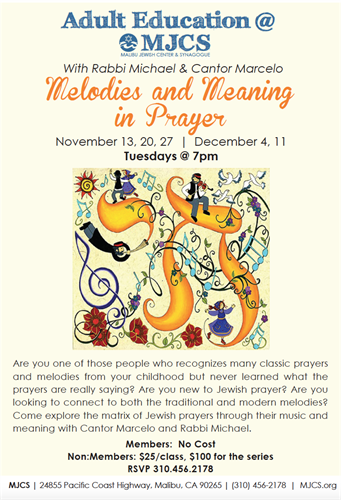 Are you new to Jewish prayer? Are you looking to connect to both the traditional and modern melodies? Come explore the matrix of Jewish prayers through their music and meaning with Cantor Marcelo and Rabbi Michael at the Malibu Jewish Center & Synagogue.